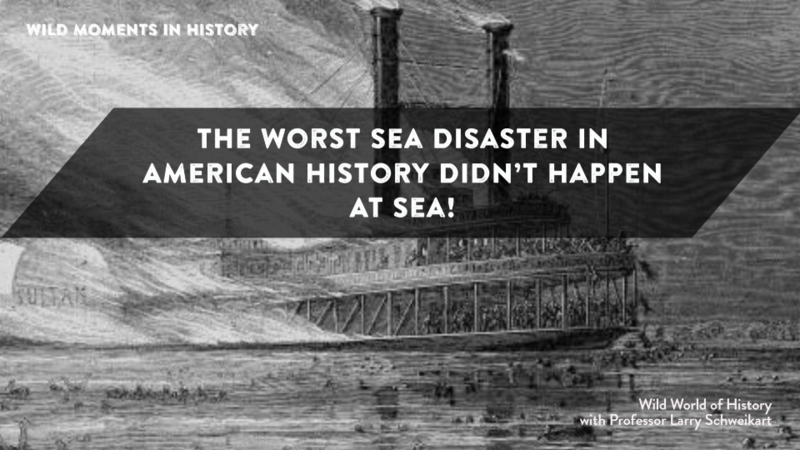 The Worst Sea Disaster in American History Didn't Happen At Sea! Did you know that the worst sea disaster in American history did not happen at sea at all? When we think of sea disasters we think of the Titanic or the “wreck of the Edmond Fitzgerald." But America’s worst sea disaster happened . . . on a river! The Civil War had just ended, and a large riverboat, the Sultana, had just docked at Vicksburg, Mississippi to pick up former Union prisoners of war from the infamous Andersonville prison. Having first traveled down to New Orleans where Sultana picked up 70 passengers to go along with its 85 crew, the vessel turned upriver and headed back to Vicksburg. During that part of the voyage, a boiler sprang a leak and was repaired in Vicksburg. All appeared in order as Sultana took aboard the paroled prisoners—some 1,961 of them, plus 22 soldiers to go along with the 70 passengers and the 85 crew. Sultana’s capacity was only 376. People were elbow to elbow, including many sick from their time in the hellish Andersonville. Overloaded, the Sultana crawled upriver for two days, briefly docking in Arkansas before making it to Memphis where some sugar was off loaded. On April 27, at 2:00 in the morning, just seven miles outside of Memphis, both boilers exploded, having been overworked by the weight and the downstream current. The explosion occurred directly under the pilothouse, killing the captain and pilot crew, and the Sultana drifted like a drunk. Decks collapsed into the fiery boilers. Survivors leaped into the water, but many of the former prisoners were in such emaciated condition they died in the strong current. It wasn’t until bodies floated past the Memphis waterfront that rescue parties were sent out. Even if people made it into the water, they faced hypothermia. Of the 2,155 people aboard, 1,192 died in America’s worst water disaster.